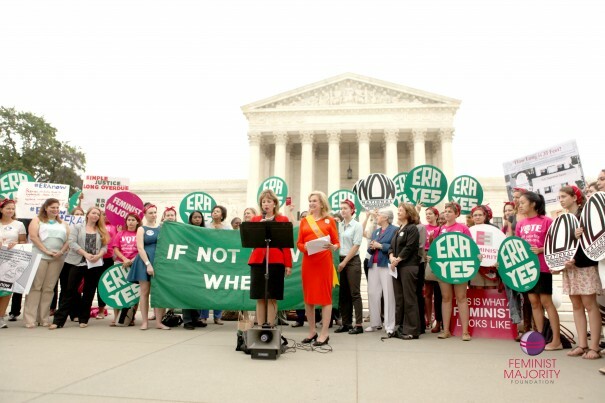 Congresswomen Carolyn Maloney (D-NY) and Cynthia Lummis (R-WY) re-introduced the Equal Rights Amendment yesterday in a bipartisan effort to put women in the United States Constitution. A bipartisan coalition of 170 cosponsors have signed on to this bill, including representatives Maloney, Lummis, Congresswoman Speier (D-CA), Rosa DeLauro (D-CT), and many more. This motion comes alongside a resolution also introduced this week by Speier in support of the ERA. Congresswoman Speier also introduced yesterday a joint resolution with 146 cosponsors this week to remove the deadline previously set by congress and allow for ratification of the ERA through a “three-state strategy.” If the deadline were lifted, only three more states would need to ratify the amendment. 35 states currently have a state-wide ERA on the book, with Oregon being the most recent to ratify a state ERA by a near 2-to-1 margin in November 2014. The Illinois House passed an ERA, but it was rejected at the state Senate in 2003. Recently, efforts for a state ERA in Illinois have renewed. As Gaylynn Burroughs, the Director of Policy and Research of the Feminist Majority Foundation, explained in the Winter 2015 issue of Ms. magazine, the need for the ERA has only increased since 1972. “Women have made numerous gains over the past four decades from Title IX to the Pregnancy Discrimination Act to pay equity to the Violence Against Women Act and much more,” Burroughs wrote. “But all the federal legislative gains are just that – legislative. They can be wiped out by a hostile Congress or Supreme Court, or chipped away slowly and insidiously.” Burroughs cites last year’s Supreme Court Hobby Lobby decision as one example of recent rollbacks. Take Action: Urge members of Congress to support the ERA by becoming co-sponsors of both the Start-Over ERA and the resolution to lift the time limit on the current ERA. Exactly what is the wording of the new ERA proposal? As compared to the older amendment which has not yet been ratified?